The core of the game revolves around team based battles, either PVP against other rival teams of characters or against AI opponents, combat is completely turn based with players choosing which actions they wish to perform and then locking them in. However, unlike other turn based games where a player then has to wait for everyone else’s turn until their own go rolls around again, in Atlas Reactor everyone chooses their actions at the same time and once everyone has locked in… the fun begins. Movement – With the mouse players can choose which square/location they wish to move to on the map, players can also create a path with various waypoints to give a more accurate movement for the character; choosing carefully which tiles they step on to avoid potential traps and environmental hazards. The Movement is the last phase to occur in the round, meaning players can’t simply move away from an area that is being attacked using their standard movement. 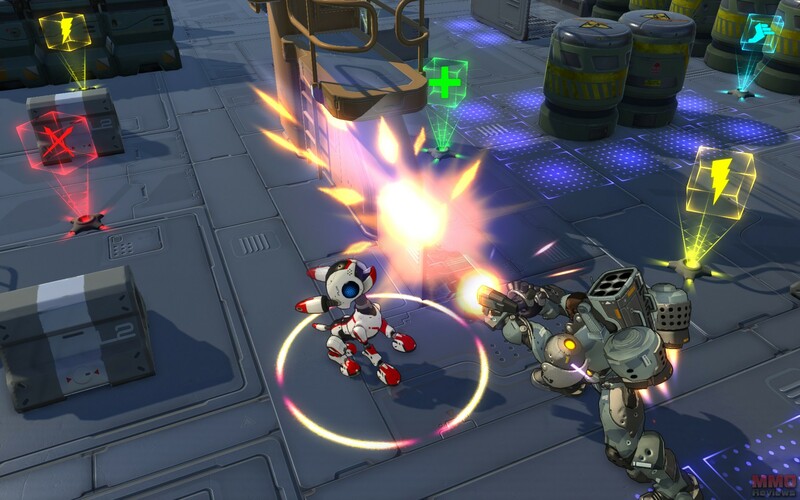 Blast – The main damage dealing abilities fall into the Blast Phase, using an ability players typically get to target an area or bring up an Area of Effect target that will show which enemies will be caught in the attack. Attacks deal damage and, when they have dealt enough to an enemy, will remove that target from the battle. Blast abilities occur before character Movement. Dash – Whilst standard movement happens at the end of the turn, some characters have Dash abilities that allow them to move BEFORE the Blast Phase, able to dodge a predicted incoming attack or evade to a safer location; the Dash ability triggers and moves the character to their new location and then the Blast ability will trigger, targeting where the player had been originally but is no longer. Prep – These abilities take place at the beginning of the round, they are mostly used for either throwing down heals to keep allies in the game, support buffs or using offensive traps that will hinder enemies. As the Prep abilities happen before the Dash abilities, it is possible to mitigate those actions so that the character is still in place for the final Blast attacks. Asana – The “Techno Tachi”, this femme fatale uses a laser sword to slice and dice her way into and out of trouble, with fast reflexes and her defensive nanotech she is able to fire out arcs of laser fire, repel attack back at enemies with her shield, or move at blindingly fast speeds to reach opponents and slash them to ribbons.